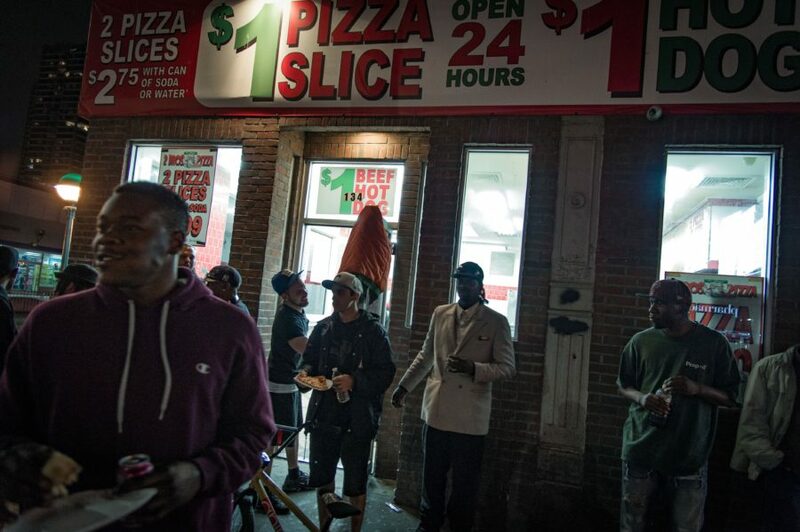 When it comes to getting some quick food in the city there’s nothing like a quick dollar pizza slice spot. In between sessions there’s always that time when you want some food and the dollar slices just saves lives, haha. Moving around late night to get some food can also be a little crazy just depending on where or what neighborhood you go into. 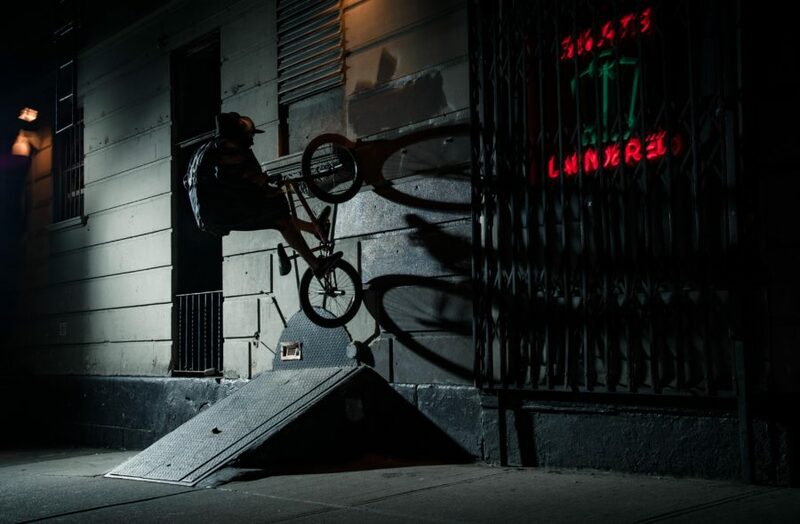 Storm doors are definitely such an amazing part of New York and for BMX itself. There’s nothing like cruising through the streets and passing by a random cellar door and smashing it up. The sound it gives when jumping on it is like no other. There’s just a whole random bunch of different setups of storm doors everywhere you go in New York. Can’t ever get tired of it. Riding at night is the best especially when I’m with the crew that I ride with all the time. I’m always out with Casio that goes by the name of “casio cult crew”. 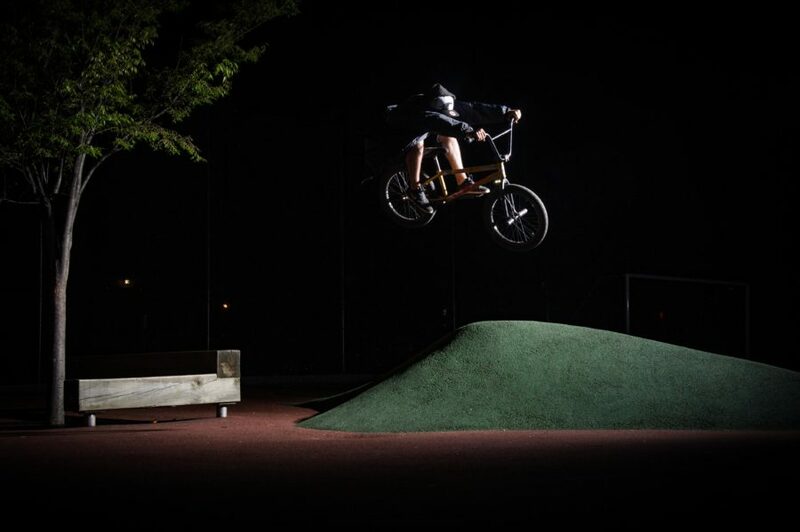 He’s a super OG legend rider from the Bronx that just kills everything he rides. Justin Morris is always killing it wherever we go ride and the homie Joan is always on the camera making some magic happen. It’s great having friends you ride with that have different skill levels or even different tricks. It helps motivate yourself and even others to keep going and riding to learn other tricks. This hip is an awesome spot, but impossible to ride during the day because of school sessions and the gates always being locked. The only way to get in is by sliding your whole arm through the gate and opening it from the inside. The homie Justin is the only one that can open the gate, haha. While shooting the photo the cops had passed by and stopped right at the gate. They started looking straight at us with the flashes all setup and the gate wide opened. We were thinking right away that we were all going to get arrested for trespassing, but it turned out that they must of thought it was really cool and just drove off slowly. Super relieved to know we all weren’t going to jail that night, haha. Times Square is always an area of NYC that has police and swat 24/7 patrolling. 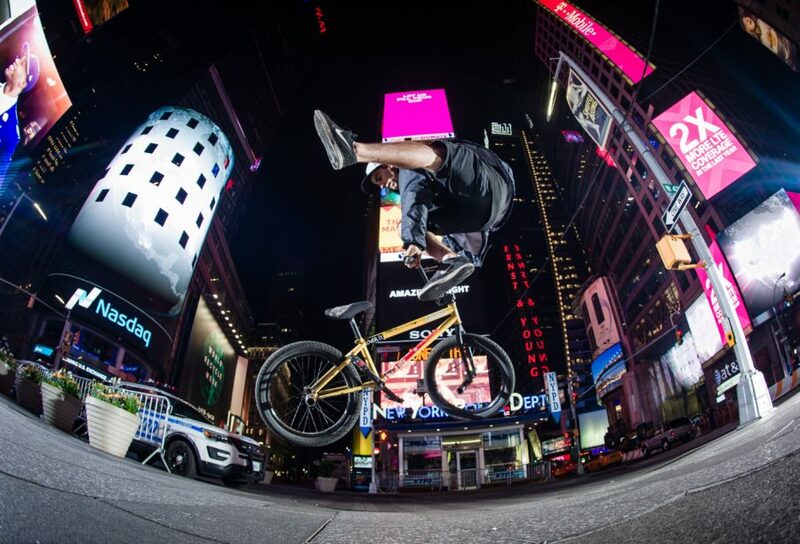 While shooting for this whip photo we had flashes set up in the middle of Times Square next to the main police station with the swat team right next to us. It’s crazy to think that not one of them came up to us to give us a ticket or the boot for riding on the sidewalk or for even having the flashes setup in front of peoples walk paths. Doesn’t matter what time it is, Times Square will always be alive with a lot of people. Words by Martin Ochoa, photos by Chris Marshall. This entry was posted in Random and tagged martin ochoa, nyc night missions. Bookmark the permalink.